The Laundry Workers' Center offers a model for how to organize worker power in precarious industries. Worker organizer Nii Yarlaí McKie-Yarboi celebrates after the first action, organized by the Laundry Workers’ Center. At a clandestine, late-night meeting in Manhattan, Mahoma Lopez leaned forward and addressed the soft-spoken man fidgeting with his hands a few feet away. “So, Joshua, are you ready to be part of the history of the labor movement?” Lopez asked. An impish expression flitted over the man’s face. In less than 24 hours, Ghanaian-born chef Joshua Duah planned to barge into an upscale restaurant in Manhattan, flanked by the establishment’s workers, dozens of supporters and a makeshift marching band. His goal: to thrust a list of demands into the hands of the manager who had fired him a month earlier. The man stared at Lopez, who was something between Duah’s role model and his doppelganger. Less than a year earlier, Lopez had passed through this very same trial-by-fire action, making headlines for himself and the Laundry Workers’ Center, a young, volunteer-run labor organization that helped bludgeon Lopez’s restaurant into accepting a union contract. The other organizers in the room chuckled at Lopez’s grandiosity. But the real, unvoiced question remained in the air: Could this fledging labor organization, with Lopez now one of its lead organizers, really achieve the impossible — again? Across the country, low-wage worker campaigns are slowly developing a form of nonviolent guerrilla warfare. Given the drastic power imbalance, workers have increasingly orchestrated sporadic, coordinated skirmishes aimed at disrupting the companies’ transnational supply chain. Perhaps the most successful examples of this strategy have been the Wal-Mart wildcat strikes that temporarily disrupted activity along the company’s supply chain around Black Friday in 2012, and the mass, day-long walkout of fast-food workers across New York City a week later. These types of campaigns may be the most strategic way to wage the overall war, but a symbolic walkout rarely leads to a unionized workplace. And with more than a million union jobs lost over the last few years (95,000 private-sector union jobs vanished in New York City alone) one wonders whether it’s even possible to organize a new workplace, particularly in the middle of New York City. To answer this question, look at the Laundry Workers’ Center, which won a worker association for more than a dozen, mostly undocumented workers last year and publicly launched a new campaign two weeks ago. The tiny organization was formed in 2011 with the mission of organizing laundromats, although it diverted its attention to restaurants when it was approached by a handful of café workers inspired by Occupy Wall Street. Known for emphasizing worker leadership development and escalating to arrestable direct actions like workplace takeovers, the Laundry Workers’ Center offers a model, however small, for how to organize and enact new unions or worker associations in precarious industries. And now the organization is tackling a much larger target. The location of the center’s latest campaign is a Manhattan restaurant named Dishes, an expensive, self-serve establishment that employs approximately 90 workers — nearly five times more than the last organizing site. Dishes is guilty of a slew of labor violations, according to current and former employees. Many attest to working 50 to 60 hours a week without receiving overtime, incurring insults, immigration-related threats and verbal abuse, and not receiving tips from catering orders, which one organizer working on the campaign estimates could total $500,000 in stolen payments alone. Other practices fall somewhere in between illegal and degrading, such as the restaurant’s de facto policy for illness, in which employees must present themselves to the manager, who decides whether they are sick enough to leave for an unpaid day, or the policy for shift meals, which is that workers must eat food left over from the previous day. It was this type of personal disrespect, rather than the restaurant’s allegedly illegal practices, that catalyzed the campaign in the first place. In February, Duah wrote an eight-page letter to management detailing how Dishes could improve the equipment, hygiene and workflow of its kitchen. Given that Duah is a trained chef and 12-year veteran of the restaurant, he assumed his suggestions would be considered. Instead, he was promptly fired. The action sparked anger among his co-workers. David Malcos, a 26-year-old employee from Mexico, quit. Nii Yarlaí McKie-Yarboi, a long-time employee and another native of Ghana, threatened to follow, but Duah convinced him to stay and work from the inside. The three began organizing secret meetings. Before Dishes, Malcos had worked at Bagel Express, located just across the street from the site of the Laundry Workers’ Center’s last campaign. Inspired by the months-long picket line led by Mohama Lopez, Malcos attempted to organize his own restaurant but found little interest among his co-workers. Instead, with the help of the Laundry Workers’ Center, he sued management for labor violations and took a new job at Dishes, eyes peeled for an opportunity to organize. After a frantic month of underground meetings, the workers’ first public action on March 12 went off as planned. The drummers and trombonist arrived, along with students from local universities and supporters of Occupy Wall Street. Lopez, by now a frequent public speaker, greeted the crowd on behalf of the Laundry Workers’ Center. A number of former employees invited by Malcos joined the protest as the group of approximately 50 people crowded into the restaurant’s sleek, sterile interior. Duah presented the letter of demands, signed by more than 20 current workers, to the manager. 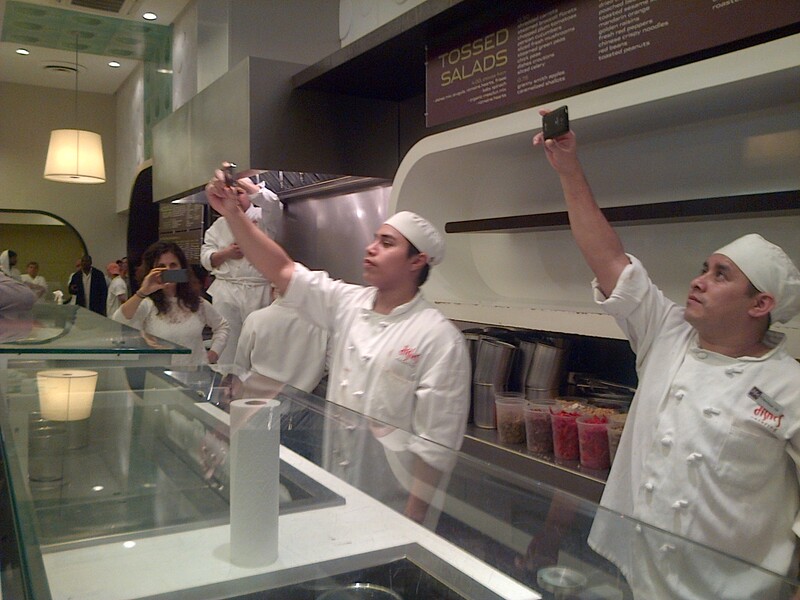 At least a half-dozen on-shift workers, clad in white chef uniforms, pulled out their camera phones and began filming the spectacle. “Está bien,” one worker affirmed with a discrete thumbs up. Soon, the revilers filed out the door and amassed outside. Malcos jumped up and down in the air; Duah raised his arms like a preacher and gave an impassioned speech. Employees in the office on the second-floor above the restaurant leaned out the window, pumping fists and cheering as a midtown sidewalk momentarily transformed into a labor-rights carnival. But the celebration was short-lived, and scripted life continued around it. The manager ordered one of the workers on shift who had not participated in the protest to haul out the garbage, and soon a short man with downcast eyes began lugging the refuse out the side door and onto the curb. An elderly man balancing two massive plastic bags filled with cans and bottles over his shoulder arrived and began sifting through the garbage for the recyclables that he would later rebate for cents to survive. The following morning when Nii Yarlaí McKie-Yarboi arrived at 4:30 a.m. for his shift, he was fired. The center may not be able to tackle all economic exploitation at the same time, but benefiting from over-reactive managers is what the Laundry Workers’ Center does best. 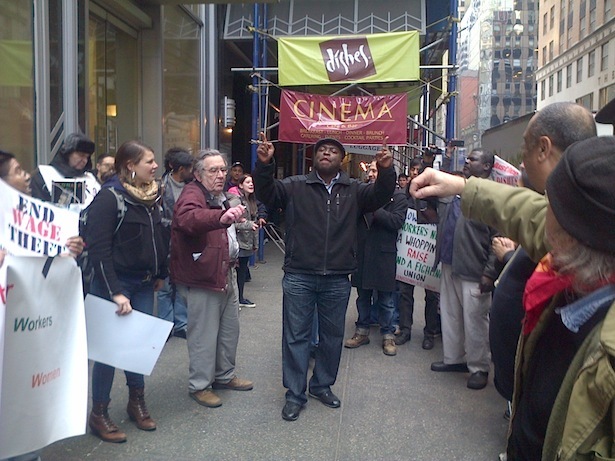 Within 24-hours of McKie-Yarboi’s firing, about a dozen workers began a daily picket outside the restaurant. At the management’s emergency meeting, where everyone was threatened with dismissal, lead worker organizers whispered “el pueblo, unido” under their breaths, reassuring others with fragments of the Chilean resistance slogan. Meanwhile, lawyers working pro-bono with the Laundry Workers’ Center filed suit with the National Labor Relations Board for the illegal retaliation against McKie-Yarboi. The second round had begun, and organizers appeared more excited than daunted. The energized reaction recalled Duah’s observations the night before the initial action, when he explained that most of his co-workers wanted to organize, but that fear stood in the way. “It’s like someone who wants to hit only to jump back,” he said, throwing a jab and then recoiling. The motion embodied not only skittish workers but the broader low-wage worker movement’s overall strategy: Strike, retreat. Strike, retreat. Strike, retreat. But the Laundry Workers’ Center isn’t known for shadow boxing, and Duah had confidence that the first action would spark a full-fledged fight, one likely filled with direct action. Andrew Lindsey I think one of the things that has to be considered is how much union heavy-handedness and arrogance itself has led to the loss of union jobs. So many situations where strikes have been called and maintained against the wishes of the workers. Linda Morrison I agree with Andrew. More of the same won´t change anything. 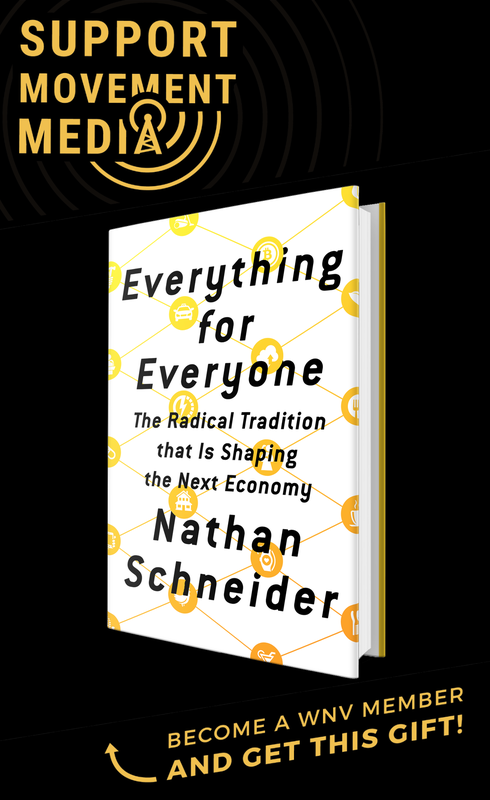 I think the cooperative models out there are MUCH healthier ways of organizing workplaces AND people´s lives and livelihoods. The New Low News Show I sure hope so.